We’d love your help. 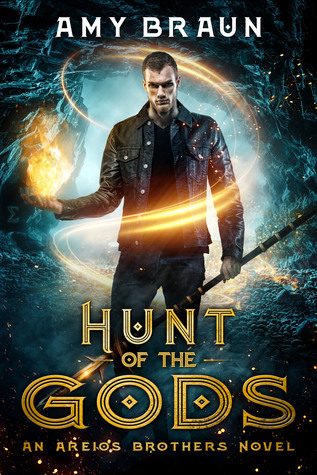 Let us know what’s wrong with this preview of Hunt of the Gods by Amy Braun. Power always demands a price. Two months have passed since Derek Areios—war-scion and heir of Ares—and the band of rogue scions he’s aligned with recovered both the Thunderbolt of Zeus and the Heart of the Devourer and returned them to the Gods. During the battle, Derek discovered he could control not only the element of fire, as all war scions can, but also the dark elemen Power always demands a price. Two months have passed since Derek Areios—war-scion and heir of Ares—and the band of rogue scions he’s aligned with recovered both the Thunderbolt of Zeus and the Heart of the Devourer and returned them to the Gods. During the battle, Derek discovered he could control not only the element of fire, as all war scions can, but also the dark element “aether,” making him the only scion alive to wield two types of elemental magic. Commanded by Zeus to retrieve the Trinity Weapons and the Shards of Cronus, Derek and the rogue scions are thwarted in their goal by a gang of water scions with a grudge against one of the rogues—Thea, heir of Poseidon. Both groups travel to an uninhabited island to recover one of the Shards––the Eye that belonged to Cronus, King of the Titans. But what they encounter will lead them down a path of brutal betrayals, hard truths, painful memories, and desperate actions. To ask other readers questions about Hunt of the Gods, please sign up.